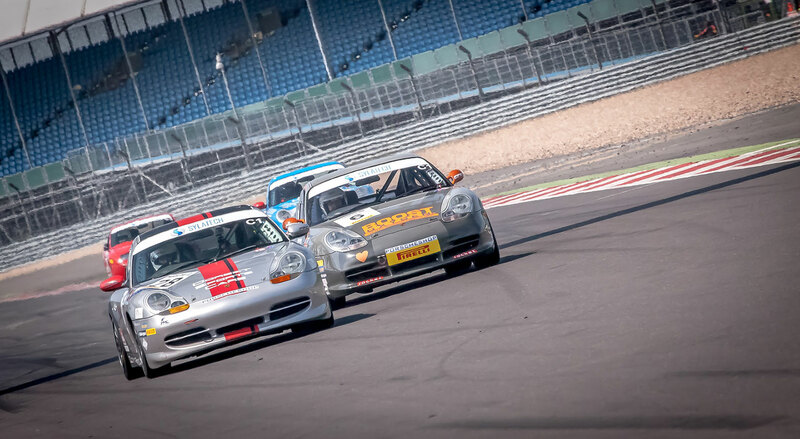 Boost Oxygen race duo Kevin Harrison and Karim Moudi were in the Porsche Club Championship with Pirelli action at Silverstone on Sunday 5th June, recording top ten finishes in both races on the circuit’s historic Grand Prix layout. Kevin made one of his trademark good starts in the opening race and was second into the first corner from fourth on the grid, Karim sixth in his sister Porsche 996 C2. Just when another strong finish for Kevin looked on the cards, a gearbox issue saw him lose places, slipping down to fifth and becoming part of the multi-car battle for fourth that Karim was also wrapped up in. They crossed the line in fifth and seventh, the pair then looking forward to the second of the day’s 25-minute races. From further down the grid Kevin was battling for fourth at the end of the opening lap, the circuit now bathed in bright sunshine, and once more the Boost Oxygen Porsches were in the thick of the top ten action, at the chequer flag Kevin fifth with Karim a battling eighth overall. “It’s been a day of mixed fortunes,” explained Kevin. “I always love Silverstone and we have done well here normally. Qualifying was good for race one, I made two really good starts and was up here fighting for second in race one when I started to have gearbox issues. Next Races: Donington Park, East Midlands, June 18th.